DRG director Dr. Kay Palan is dean and professor of marketing at the Culverhouse College of Business at the University of Alabama in Tuscaloosa, Alabama. The flagship business school is home to over 9,000 students, 350 faculty and staff and 50,000 alumni. 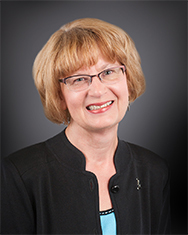 Palan previously served as dean of the business school at Western Michigan University; she started her academic career at Iowa State University. Prior to her academic career, Palan established and managed a successful for-profit home health care corporation. Palan is an experienced consultant to a wide variety of profit and non-profit organizations on issues related to marketing, branding, feasibility analysis and strategic planning. She also is recognized for her expertise in the areas of gender and youth-based marketing issues including adolescents’ influence on parental consumer decisions, teenage girls’ autonomy and shopping competence and advertising impact on younger children. Palan serves on several other corporate boards and advisory committees and is an active volunteer on business school accreditation issues for AACSB International. In 2016, she was named one of the 50 Most Influential Women in West Michigan. Palan holds a B.S. degree in Nursing from Winona State University, an M.B.A. from Moorhead State University, and a Ph.D. in business from Texas Tech University.